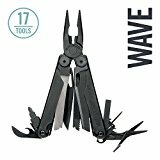 Leatherman Surge vs Wave - What's the Best Leatherman Multi-Tool? 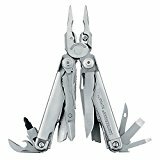 Leatherman Surge vs Wave – What’s the Best Leatherman Multi-Tool? If you’re in search of the best multi-tool, you’ll want to consider the Leatherman Surge vs Wave. Both are excellent Leatherman’s, but there are some key differences you should know about. A multi-tool is great to have for camping in the outdoors or just having handy when you need to fix something. Hell, just if you need a pocket knife they can be a great choice and give you extra tool options when you need them. Leatherman models today are surprisingly thin and light due to their design and materials, but of course they will weight more than a stand along pocket knife. However, if you are looking to carry a wider array of tools in your pocket, a multi-tool is the right choice. In this article we’re going to break down everything you need to know about the Leatherman Surge vs Wave. At the end of this Leatherman Surge vs Wave review you’ll know the good, the bad, and the ugly which will hopefully help you choose the best Leatherman multi-tool for you. What Will You Use Your Multi-Tool For? Leatherman Surge vs Wave – Which is the Best Leatherman Multi-Tool? When you’re in the market for a trusty Leatherman multi-tool there are several considerations to look out for to make sure you choose the right model for you. 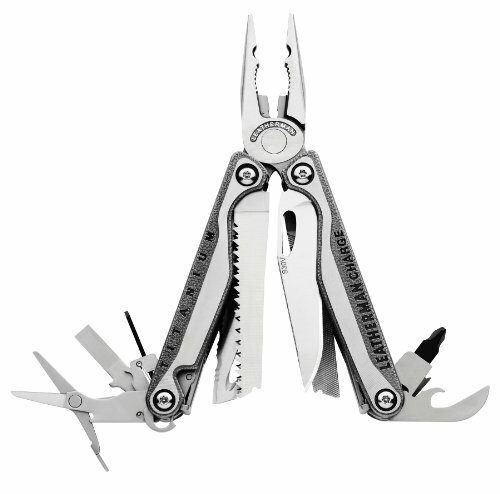 And even if you are not set on buying a Leatherman, these considerations go for any brand of multi-tool you’re buying. Quality. A huge factor of what makes a good multi-tool vs great multi-tool is it’s build quality. Sure you can find a cheapo multi-tool at Harbor Freight or Home Depot, but these tools are poorly designed and built. They won’t hold up to the abuse and certainly won’t compete with the best multi-tools out there. The bottom line is that there are a lot of moving parts on a multi-tool and everything needs to be constructed precisely, if not the tool will feel loose or too tight when moving tools open and closed. It’s also important to buy one made with higher quality metal that is much more resistant to corrosion over time. Knife blade. Depending on your activities, the knife blade is likely the most important tool that you will use on your multi-tool. And if you know anything about pocket knives, having a blade made from high quality steel is everything. As a quick guide you should look for multi-tools with blades made from at least 420HC, 154CM is mid-range and S30V is high-end. High quality steel will keep it’s edge longer and hold up better overall. Design. Just because a multi-tool has more tools doesn’t mean it’s better. A well crafted multi-tool is well thought out. It should have the necessary tools, but also feel great in your hand and allow you to get leverage when using various tools. You don’t want large voids inside the tool that to collect dirt and make it harder to clean. Ideally the best multi-tool is compact and dense with every space housing a different tool. Value. When it comes to parting with you hard earned money you want to make sure you get value from your purchase. 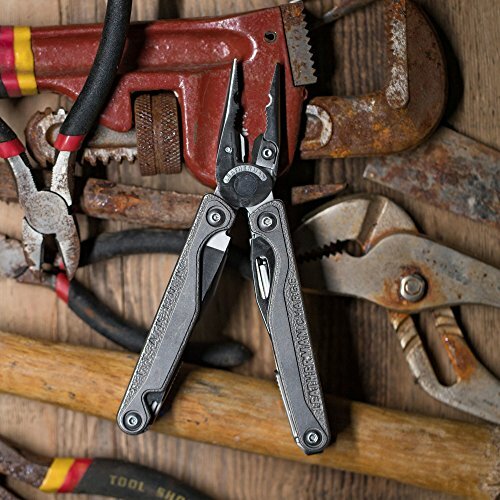 For one, Leatherman is one of the most trusted and reliable multi-tool manufactures out there. With there extensive history and use of high quality materials they have perfected the art of making some of the best multi-tools. 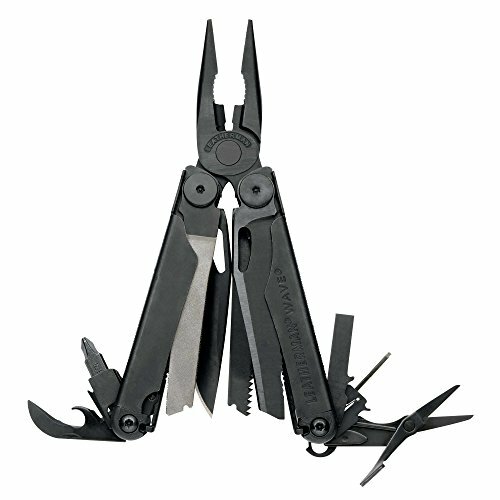 The Leatherman Wave is a cult following and is regarded as the most popular Leatherman multi-tool. Chock full of useful tools, but yet compact and light enough to carry around daily is exactly what makes the Leatherman Wave a best seller. And for most consumers it will be the perfect multi-tool. The original Wave was replaced with the new Wave in 2004, and just this year it was upgraded again to the Wave+. The latest update include replaceable wire cutters and brings the total tools to 18. 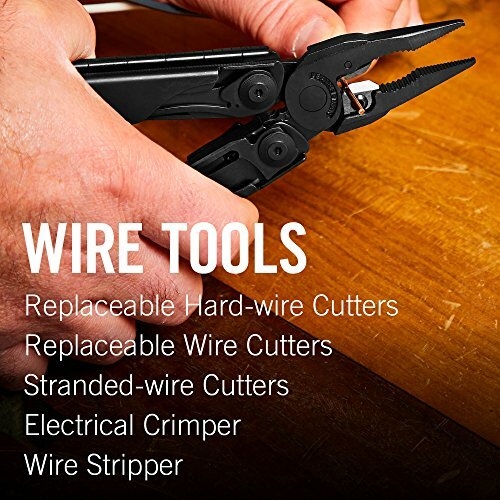 The Wave’s main tools include 2 pliers, two 420HC knife blades (plain edge and serrated), electrical crimper, wire stripper, spring-action scissors, a wood/metal file, a saw, 2 drivers (large and small bit), 2 double-ended bits, replaceable wire cutters, a diamond-coated file, plus bottle openers. Constructed from 100% stainless steel the Wave comes in two colors, plain stainless steel or black oxide finish. 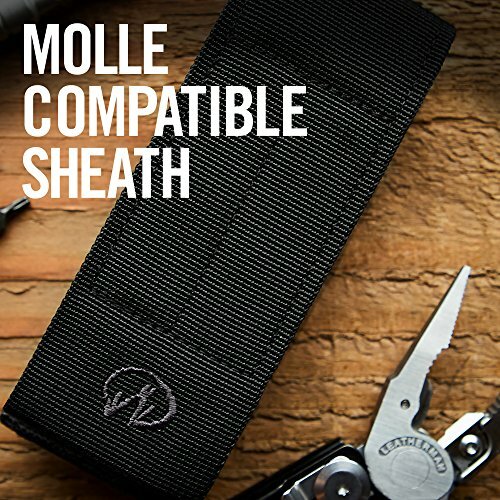 Both colors come with a nylon sheath, but the black color features a MOLLE system sheath. At 8.5 ounces, the Wave is considerable lighter than the Surge, which tips the scale at 4 ounces heavier. This is a substantial amount if you will be carrying around your multi-tool on a daily basis. The hard-to-beat combination of lightweight and tool functions is what made the Leatherman Wave so popular. The Wave measures 4 inches in length when closed, which is 0.5 inches shorter than it’s Surge counterpart. The 420HC steel body of the Wave is 11/16 inch thick and 1 3/8 inches wide when folded. Now let’s talk knife blades. When it comes down to the plain edge knife blade, at 2.9 inches the Wave’s blade is just a hair shorter than the Surge’s 3.1 inch blade. Both are made from 420HC heat-treated stainless steel, which is a solid choice—durable and user friendly for sharpening. The serrated knife blade on the Wave measures 3 inches long vs the Surges 3.25 inch long blade. With the longer blade, you do get added cutting edge on the Surge. However, it’s not a deal breaker in either case. 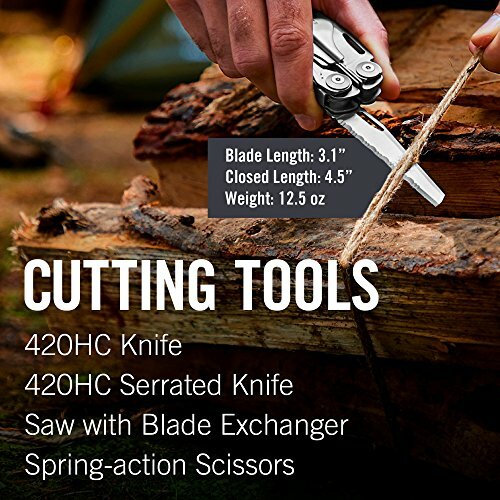 The serrated blade is made from the same 420HC steel as the plain edge blade. The bottom line is that the Wave is Leatherman’s most popular model for a reason. It’s tough, yet compact, and built to do the job with it’s 18 tools. Plus for the money it’s bar none the best value Leatherman on the market. The bottom line when it comes to the Leatherman Wave vs Surge is that the Wave is a slightly smaller, lighter weight tool that lacks a few extra tool options that come on the Surge. It’s an excellent choice for almost every user, especially if you want a easier to carry tool. If you are looking for a bigger Leatherman that is built to tackle any task you can throw at it, the Leatherman Surge is a top contender. This tool is packed with 21 tools, which makes it capable of almost any fix or repair you run into. The main tools on the Surge include a both a serrated and unserrated 420HC knife blades (yes, it has two), large pliers, 154CM replaceable wire cutters, both hard-wire and stranded-wire cutters, electrical crimper, awl with thread loop, and spring-action scissors. Additionally, the Surge has a unique feature called the Blade Exchanger that allows you to swap out Leatherman blades. The two options that come with the Surge include a open-tooth saw and two-sided file. For other jobs you have two files, screwdrivers, a can and bottle opener, plus more. You get the point, the Surge is packed with tools. The main difference between the Surge and Wave regarding screwdrivers is that the Surge features a large and small screwdriver, plus a large bit driver. In comparison, the Wave has the same large bit driver, plus a small bit driver and a medium screwdriver. When it comes to the Leatherman Surge vs Wave, something to consider is that the Surge does offer longer blade length. It’s important to note that this comes at the cost of weight and size, so if you are looking for a more compact muti-tool you’ll want to stear towards the Wave. Weighing in at 12.5 ounces and measuring 4.5″ long when closed the Leatherman Surge is be no means a lightweight. This makes it pretty impractical to carry around for EDC. It’s much more at home stored in your bag, garage or truck. If you need a larger tool to crank out tougher tasks, the Surge is just that. The bottom line is that this tool is a beast of a Leatherman built for heavy duty tasks. 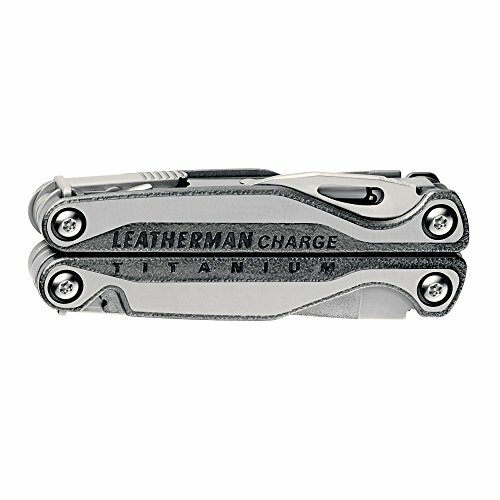 The Leatherman Charge is essentially a premium version of the Wave. With upgraded materials they are harder and will hold an edge longer. The Charge is offered in two versions, the Leatherman Charge + and Leatherman Charge TTi, with the major difference between the two being the material. With the Charge TTi you get a lighter weight tool with excellent materials. The S30V steel knife blades (plain edge and serrated) are some of the best blades that you’ll find on multi-tools. 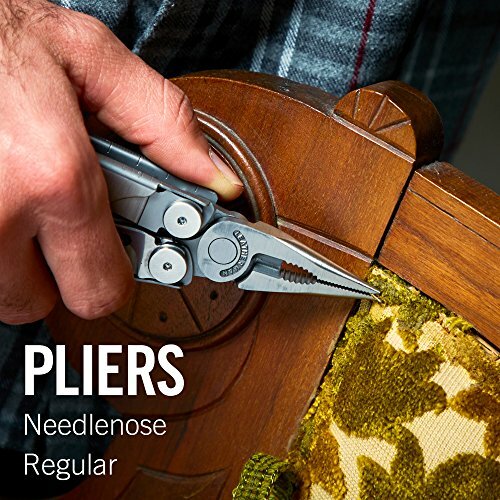 Other tools (19 in total) in the well-designed multi-tool include needlenose pliers, both a regular and hard-wire cutter, small and large bit driver, a screwdriver, two files, a saw, spring action scrissors, a cutting hook, and a can/bottle opener. There is also a wire crimper and wire stripper for the electrical jobs. The body is consctructed from high-quality titanium, which helps save weight. When comparing the Leatherman Wave vs Charge TTi the biggest factors to consider are the few additional tools, an upgraded titanium handle and blade steel. Although this comes at a price, as the Charge costs a pretty penny more than the Wave. If you want the best of the best it could be worth it, if not the Wave is an excellent choice for most consumers. You’re probably already familiar with Leatherman and know that the brand is one of the most well-known multi-tool makers in the industry. 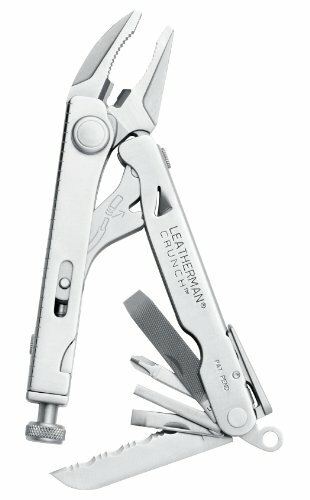 Heck, Leatherman pretty much coined the term ‘multi-tool’. 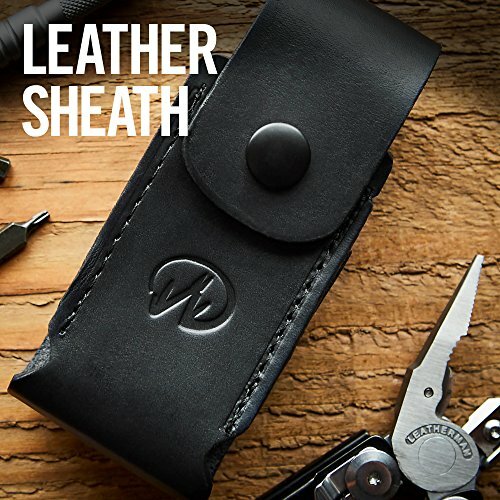 The brand started with humble beginnings back in 1983 with Timothy S. Leatherman and Steve Berliner founded this American-based pocket tool company. Their first product was designed as a do-it-all portable tool for outdoor and repair tasks. Basically it was designed to eliminate the need to haul around a tool box when you can get the job done with one. Aptly named, it was called the PST (Personal Survival Tool). The Leatherman brand and product line quickly grew and now dominates the US market share for multi-tools. Currently they are based out of Portland, Oregon and offers 36 different multi-tools. If you are looking for a USA made multi-tool made in the USA, Leatherman is one of the few manufacturers that can claim that their product is made on American soil. The important part is that Tim Leatherman, the founder of the company, has kept production of his products on US soil with American steel. Each tool is manufactured from a 200-step process, including hand assembled to insure precision and quality. Although Leatherman cannot out compete China in terms of low cost manufacturing, they are a step ahead when it comes to innovation, producing tools with highest quality craftsmanship and supporting US workers. 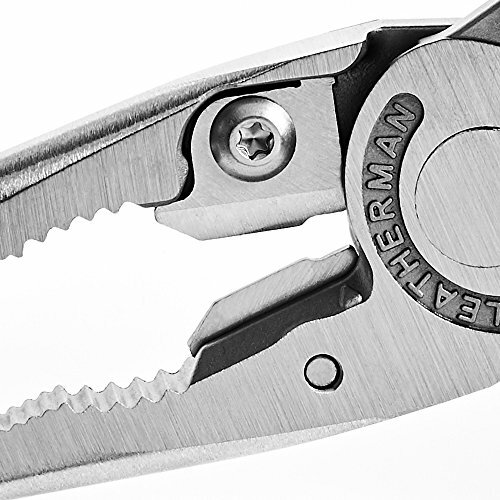 Offering an impressive 25-year warranty, Leatherman clearly stands behind their product. Although I haven’t had to personally send in either of my Leathermans yet, I’ve heard only good things about Leatherman’s customer service. In most cases it’s a no questions asked repair of replacement. Plus, if you do need to use their warranty they’ve made is super simply. You can download a warranty form, fill it out, box up your tool and ship it to their factory in Portland, Oregon. 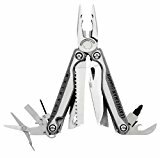 Leatherman Skeletool – A 5 ounces, the Leatherman Skeletool is a one of the lightest multi-tools on the market. It saves weight by matching a stainless steel body for strength with a 6061-T6 aluminum handle. But don’t let it’s lightweight fool you, it packs a punch with 7 tools and a partially serrated knife made from 420HC stainless steel. Other tools include a Phillips and Flat Head screwdriver, regular pliers, needle-nose pliers, and both hard-wire and normal wire cutters. You can also attach the tool easily to your pack with it’s integrated carabiner, which doubles as a bottle opener when all the hard work is done. When comparing the Leatherman Skeletool vs Wave or Charge you give up some extra tools, but you get a lighter weight tool that can can be easily carried around in your pocket for EDC purposes. 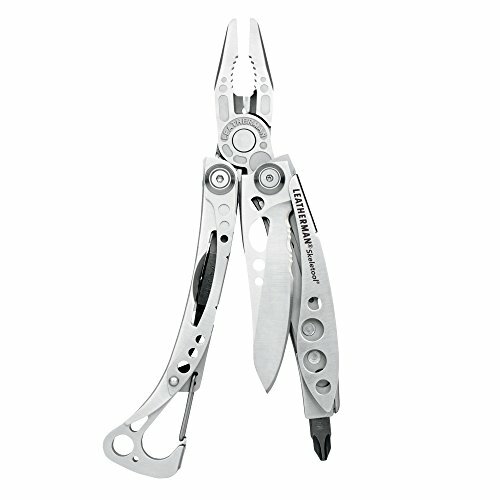 The Leatherman Skeletool is also one of the best multi-tools for the money. 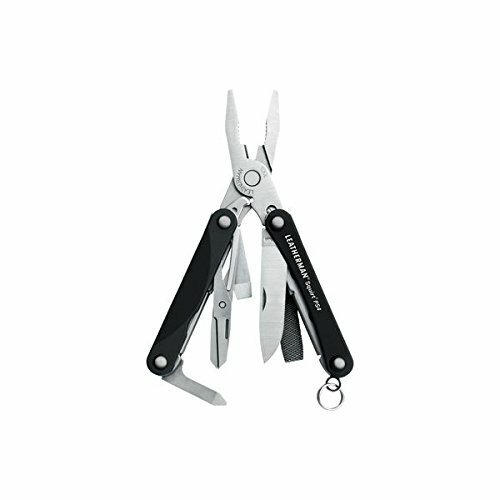 Leatherman Juice CS4 – The Juice CS4 is one of the best smaller sized multi-tools out there. At just 3.25″ in length when closed it can easily be stored in your pocket or backpack. Plus, the small length makes it ideal for anyone with smaller sized hands. With 15 different tools packed away inside the Juice CS4, it can be best compared to the Wave—just in a smaller, compact version. 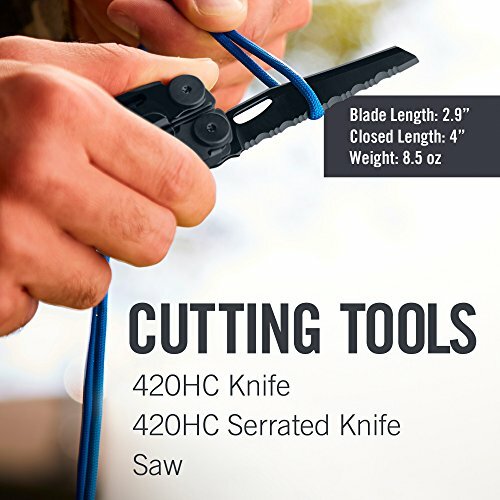 You get almost every essential tool including regular and needle-nose pliers, hard-wire and regular wire cutters, a compact 420HC knife, a saw, scissors, 4 screwdrivers, an awl, and bottle opener and corkscrew. When considering the Skeletool vs Juice CS4, the top things to know are that the CS4 is more compact and tips the scale at around 0.5 ounces heavier. It also costs a bit more than the Skeletool. 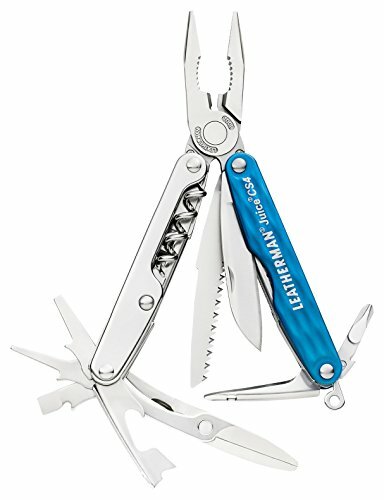 Leatherman Squirt PS4 – If you want to even go smaller, the Squirt PS4 is one of the smallest Leathermans available. At 2.25 inches it packs away 9 tools, including a 1.6 inch 420HC knife. 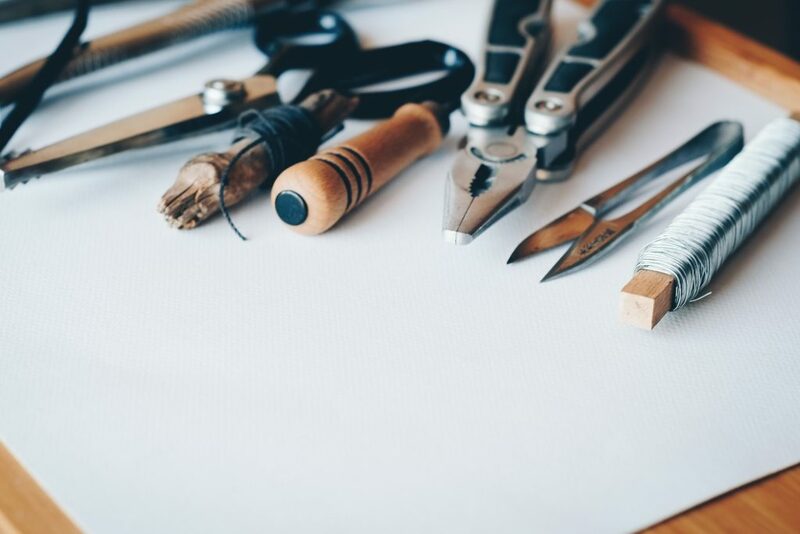 The Squirts other tools include scissors, regular and needle-nose pliers, Flat and Phillips Head screwdriver, a bottle opener, and a metal/wood file. At 2 ounces you won’t even know you’re carry this tool around, whether you have it stowed away in your pocket or attached to your bag with it’s key ring attachment. If you want to opt for something different than a Victorinox Swiss Army knife, the Squirt PS4 can be the perfect choice for an handy, easy-to-carry EDC multi-tool. 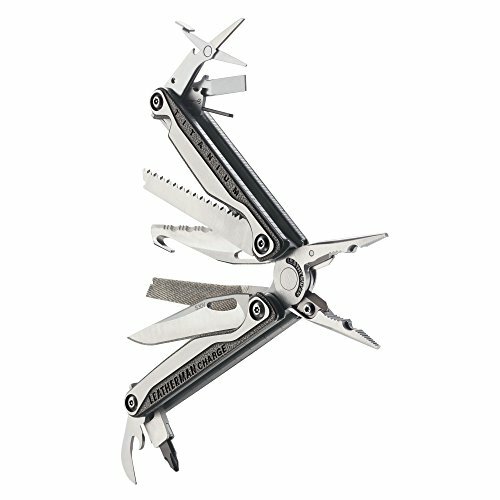 Leatherman Crunch – If you are looking for a multi-tool with a wider array of tools, the Crunch could be the right match. 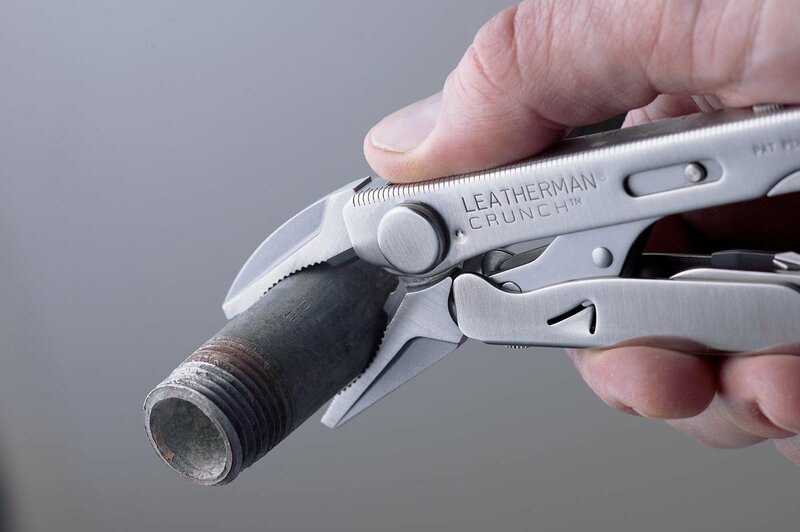 The unique design of the 4″ long Leatherman Crunch features vise-grip pliers, which just goes to show how innovative Leatherman is. Apart from it’s burly locking pliers, some of the Crunch’s 15 tools include wire cutters, a hex bit driver along with various screwdrivers, and a 420HC serrated knife blade. All this packed into a 6.9 ounce package, which is lighter than both the Wave and the Surge. So, you want a multi-tool? The first and biggest factor to consider when choosing the right multi-tool is: how and when will you use it? Will you throw it in your pack for camping? Carrying it along on the job—construction? Firefighter? Want a tool stashed in your glove box for road trips? Or do you just want a compact tool to keep around the house? The thing is, there are tons of variations of multi-tools. Even when just comparing small difference such as in the Leatherman Surge vs Wave, you’ll find that one tool makes more sense for you. Choosing the right model based on the types of activities you will be engaging in will ultimately make it a more useful tool. The last thing you want is expensive multi-tool collecting dust on your closet shelf. You can find are endless tool combinations out there in today’s multi-tools. You can narrow down and easily eliminate many models by simply having an idea of what tools you need and will use. Next you’ll want to only consider multi-tool models that feature the tools you’ll need. Above and beyond this tool combination, consider additional tools a bonus, but not a necessity. Once you’ve found all the models that feature your necessary tools you can narrow it done even further by setting a maximum weight or size that you want to carry around. Further you can eliminate a multi-tool based on it’s materials, or where they are manufactured. It all comes down to personal preference, but going through all your options will help you find the right multi-tool. Will you use your multi-tool on the job? What about hiking and camping? Deciding how and when you will be using your tool can help you narrow down what tools will be essential on your multi-tool. You’ll find some multi-tools designed for more specific tasks, such as electrical repairs or outdoor activities such as camping. 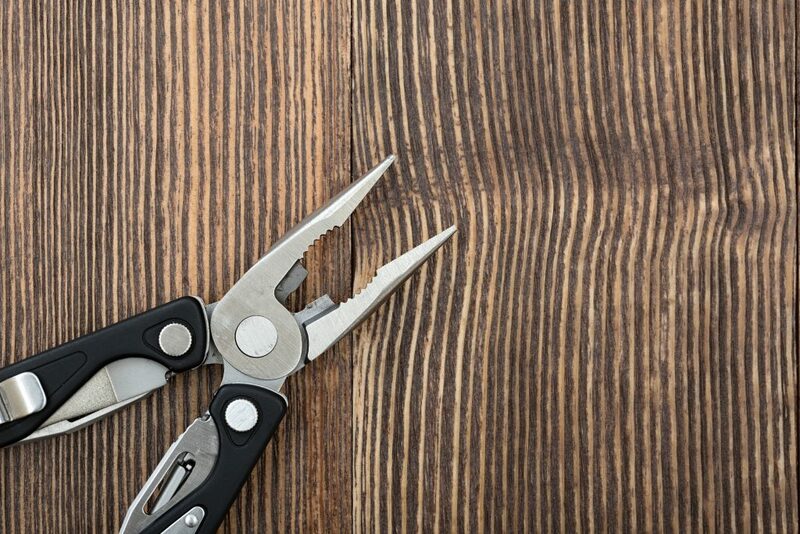 Almost all tools will come standard with pliers, knife blades, and screwdrivers. If you need something special be sure to compare tools with the right tool options. Another thing to consider is that having more tools does not always make the tools better. It comes down to design and placement of the tools. If the tools is too bulky to handle or you cannot get the leverage you need, you’ll find the tool to be a lot less useful or just down-right uncomfortable to use. With multi-tools, a high-quality design trumps all. The knife blade will likely be the most used tool on your multi-tool, which makes it important to go with high quality steel. After all, when it comes to knife blades, it is the steel that can make or break a good knife (literally). The higher quality the steel, the longer the knife blade will hold a sharp edge. 420HC – A lower-mid range steel that is easy to sharpen and is extremely corrosion resistant. This makes it a great steel to use for multi-tools which see tons of abuse. It’s offers some of the best value for the money which is why it’s widely used on budget pocket knives and tools. However, it won’t hold an edge as long as higher quality steels. 154CM – This steel is basically an improved 440C steel that benefits from the addition of Molybdenum. It offers higher levels of corrosion resistance, holds an edge longer and is not all that difficult to sharpen. There are tons of great pocket knives as well as mid-range multi-tools that use this steel for their blade. S30V – When it comes to multi-tools, this steel is top-of-the-line. It’s excellent at resisting corrosion and offers incredible edge retention. It’s made by Crucible, a US based company, which originally designed it for high-end pocket and kitchen knives. The addition of vanadium carbides produces an incredibly tough, hard steel that keeps it’s edge a ridiculously long time. Considering the Leatherman Surge vs Wave, both have the same 420HC steel blade. The major difference is blade length and blade changeability that comes with the Surge. If you want an upgraded blade you might want to opt for the Charge TTi that comes with an upgraded S30V blade. You want your multi-tool to fit comfortable in your hand and allow you to leverage it when using it’s tools. This comes down to the design and ergonomics of the tool handle and size. It can’t be too small or you can’t get the right amount of leverage on tougher tasks. If it’s too big your hands may not be able to grasps the tool enough to gain the leverage you need. A lot of this comes down to the size of your hands in relation to the multi-tool’s size. Avoid tools that jam-pack as many tools as possible into their design. This often comes at the price of ergonomics and makes the tool hard to handle. Both the ergonomics of the Surge and the Wave make them feel great in your hand, but with the Surge being a bit larger which could work better for someone with larger hands. How and when will you carry your multi-tool? You’ll want to consider the overall size and length of the tool. Avoid bulky tools if you plan on carrying it in your pocket. Not only is the size important, but a heavy tool can be annoying if it’s pulling on your pants pocket all day. Comparing the Leatherman Surge vs Wave, the Leatherman Wave is 0.5 inches shorter and 4 ounces lighter than the larger Surge. For further reference, the Squirt PS4 only weights 2.0 ounces and measures 2.25 inches when closed. With today Leatherman’s your not just limited to plain stainless steel. 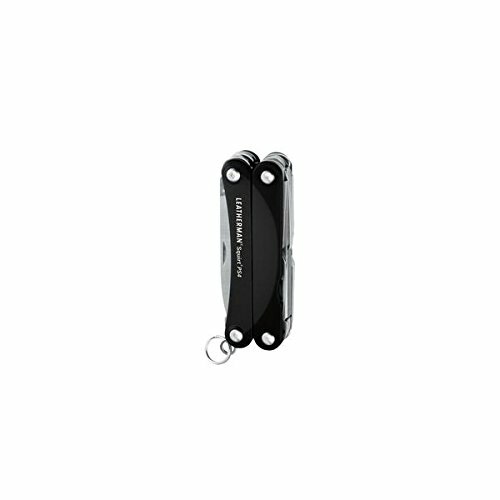 Many Leatherman models including the Wave and Surge come in a black oxide finish. This color is sleek and stylish, but not too loud. 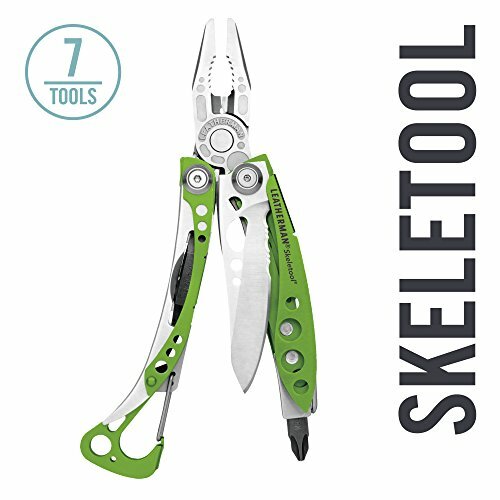 If you are after another color Leatherman offers some models in various anodized colors, such as the Skeletool in green. Buying the right multi-tool means buying it for life. A well built multi-tool will hold up against the toughest abuse and last for decades. Look for a tool that keeps all it’s moving parts tightly stowed away when not in use. Tools should also move fluidly and not feel loose. Since corrosion is something that plagues almost metals, material also plays a big factor in multi-tool durability. And not all stainless steels and aluminum are created equal. A higher quality material will help keep your multi-tool working smoothly for years to come. When it comes to the Leatherman Surge vs Wave, both are constructed from the same high-quality stainless steel. Stainless steel is the most cost effective, yet durable material for multi-tool. If you want an upgrade you can consider a titanium or aluminum model. A company that stands behind their product always goes to show they believe they are producing a high quality item. Leatherman is one of these companies. They offer a great warranty and stand behind their work. 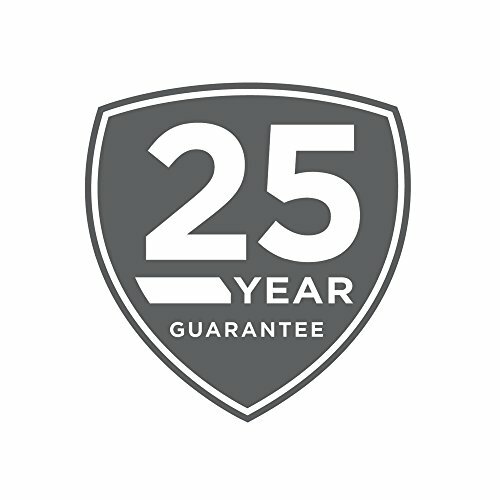 After all, the last thing they want is for you to submit a claim on their 25 year warranty. But don’t worry, if you do you’ll be covered. No matter what gear you are buying, value for money is always a factor. Which means value for money is always something to consider when ranking products. There is always a happy medium when finding a balnce between value and quality, and Leatherman is one of the top multi-tool manufactures to do this. When comparing the Surge vs Wave, both are a great value and priced very closely. For the money both are among the best Leatherman multi-tools for the money, which also makes them the most popular. 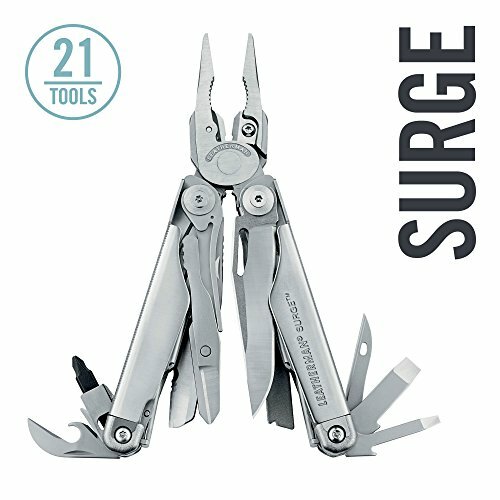 Given that the price of the Leatherman Surge vs Wave is very close, the main deciding factor comes down to how you’ll use and carry your multi-tools. If you want a more robust tool that can conquer almost any task you can throw at is, the Surge is the best choice. It offers additional tools and even some replaceable parts, such as the wire cutters and knife blades. The Surge also has longer blades and larger pliers for burly jobs—which can make it a more versatile tool. That said it comes at the cost of weight and size, as it’s larger and heavier than easier to carry Wave. If you don’t need the extra tools that come on the Surge, the Wave is the perfect choice for almost anyone looking for a reliable multi-tool to carry on a daily basis, keep around the house, or take on adventures. Although it’s definitely no lightweight when it comes to tool selection. Consider it’s tool choice is more refined to fit the average user. If you want a lighter multi-tool that is easier to carry, but still incredibly capable, going with the Wave is a solid bet. After all if you leave your tool at home since you don’t want to haul around the extra weight, it’s of no value! In either case, whether you choose to go with the Leatherman Surge or Wave you’ll be happy to have a reliable and long-lasting multi-tool to keep you prepared when you need a quick fix.